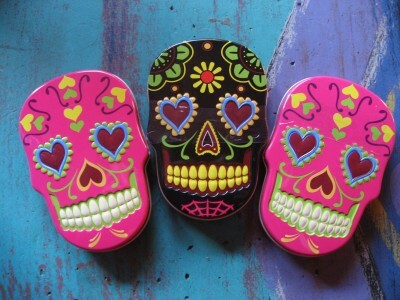 I just found these darling sugar skull tins in Tucson at the Blue Willow Cafe’s gift shop, and they made me crack up and smile! ~ by Dawn Elliott on March 8, 2013. You can be where you are and be there at the same time ! Sweet treats ! Bet these tins will be rust out awesome in the rain. I find joy in little things like this! love your haiku too! Very colorful and playful! I know a child who would love those! Little joy bits to pop in your mouth! another great find by the treasure seeking sleuth! well…we would be there in a couple weeks, instead what about this snow? i have some amazing surprises up my sleeve for san miguel, can’t wait to announce! Oooohhhh… such beautiful tins! 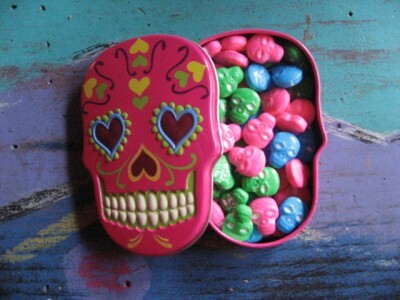 And the candy inside: amazing! They don’t sell things like that in the Netherlands, it would make me smile too! Enjoy your weekend. This looks like a fun find!! I would be tickled too if I found them!